I am a psycho-spiritual psychotherapist, author and spiritual teacher. In my early twenties I became part of the Human Potential Movement and studied with some of the leading figures of Western psychology and meditation masters. After years of study and inward searching, I had a personal breakthrough which I experienced as a transformation into authenticity. I worked hard to integrate these new insights and stabilize in the deeper understanding that I received from my years of personal work. Out of this rich experience my practice developed and I began working with individuals, couples and groups. Since 2002 I have lived in Andalucia, southern Spain, with my wife and four children. My work spans over 40 years. During that time I have worked with individuals, couples, groups and communities, both psychologically and spiritually. I have helped hundreds of people to find greater peace and fulfillment in their lives. My approach is to encourage, empower and enable people to clarify, heal, and liberate themselves from the restrictive conditioning that compromises their relationships, family and working lives. I have led groups, workshops, seminars and training courses throughout Europe, as well as maintaining a private practice. I act as a consultant to training courses, work with staff groups and communities, run supervision groups and act as a supervisor to psychotherapists. At the heart of my work is the awakening of individual consciousness, within the wider context of collective spiritual awakening, through a threefold process of work on the personality, the transformation into authenticity, and the realization of our true nature. 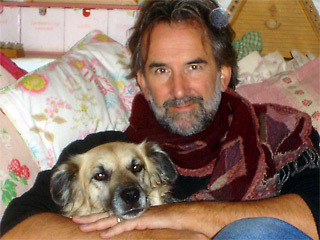 I trained at the Devon Centre for Alternative Therapy and Education for four years with the American psychotherapist Richard Dror, who had been a senior leader at Quaesitor Center for Personal Growth (the first humanistic therapy center in Europe), in existential-humanistic psychotherapy, Bioenergetics, Gestalt Therapy and transpersonal approaches (1978–81). From 1981 to 1982 I worked as a group therapist with drug offenders in drug rehabilitation (1981–2), and for ten years I was founder-director of the Change Workshops (1986–1995). I have run seminars and given talks to natural health centers, the National Childbirth Trust (NCT), private groups and communities. In 1984 with Rev. Myoho Harris I established the Soto Zen meditation group in Devon, affiliated to Throssel Hole Priory (now Throssel Hole Buddhist Abbey). Disagreeing with the direction the practice of psychotherapy is taking in its attempts to structure and formalize itself, I no longer align myself to any organization, and work independently. I extend deep gratitude to them all. And, finally, to the great silence, mouna, the sense of presence, the Divine within.